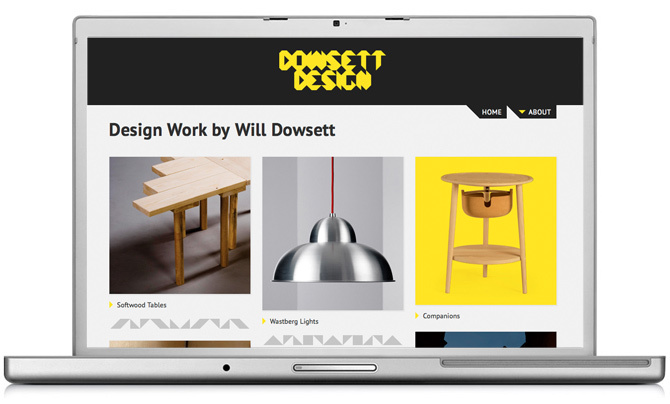 The website I designed and built for Dowsett Design is now live! Take a look, particularly if you’re interested in furniture design, lighting or installations. It’s a portfolio gallery built using WordPress so it’s easy to update when new work needs to be added to the site. The logo was redrawn to make it suitable for online use, and this informed the style of the bullet points, arrows and other visual elements on the website; everything is comprised of triangles. The homepage is an index of all the projects on the site, generated automatically and arranged using jQuery Masonry. As the work isn’t categorised or organised in any particular way, displaying all the projects simultaneously makes them immediately accessible and invites people to view the design piece most relevant to their interests. There is a selection of different dividers which appear randomly between the images on the homepage, adding some variation each time you visit. Each thumbnail image links to its own page, which displays photographs and a description of the project. It’s possible to browse through the work without needing to return to the homepage each time. You can read a little bit more about the project in the Drawn By Day projects section. Please get in touch if you’re looking for something similar for your own website – I’ll be happy to help!